Tiruchi, Tamil Nadu: A large number of devotees from different parts of the country participated in the 1012th annual Urs festival of the Sufi Saint Hazrath Thable Alam Badusha Nathervali held on the dargah premises in Tiruchi in the early hours of Saturday. The fortnight-long festival began with the hoisting of the holy flag on August 21 and installation of the Banwa Jama Sarguru. The pot containing the sandal paste was brought to the dargah in a decorated chariot from the Gandhi Market. The sandal paste was anointed on the tomb of Hazrath Thable Alam Badsha, who was the first Sufi saint to visit this part of the country, by Khalifa Syed Mazharuddin Khalandar Suharwardy. Later, the fakirs belonging to the five Jamas of Sha Banwa, Sha Malang, Sha Tabkhat, Sha Jalal and Sha Rifayee and the Muzawars also anointed the sandal paste in the presence of the chief executive trustee (CET), A. D. B. Badhushas, and hereditary trustee Khalifa M. Syed Ghulam Rasool Suharwardy. A. K. Yussouf, national president of the Builders Association of India, was among those who participated in the celebrations. Special “Fathiha” (prayers) was offered to seek the blessings of the saint. Recital of Maulood Shariff, discourses, rendering of qawwali songs by the famous qawwals from all over the country and devotional songs marked the occasion. The tomb of the sufi saint was cleaned on Thursday with the water of [the river] Cauvery. 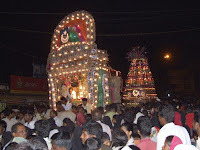 It was brought in a procession by devotees.